Its 43 degrees, been raining all day, pretty dreary. 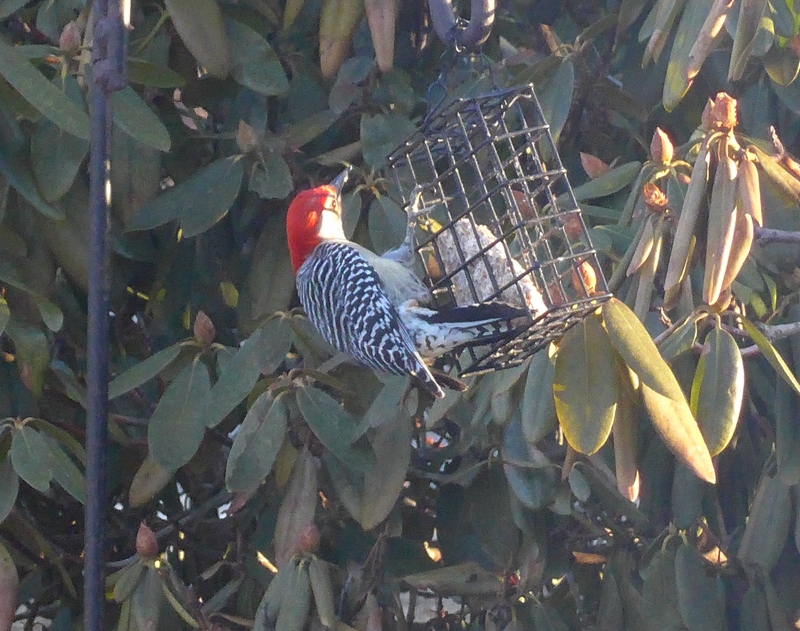 I was going to do a post about some hardy succulents, but then I heard there was a visitor across the street. I grabbed the camera and drove around the corner. 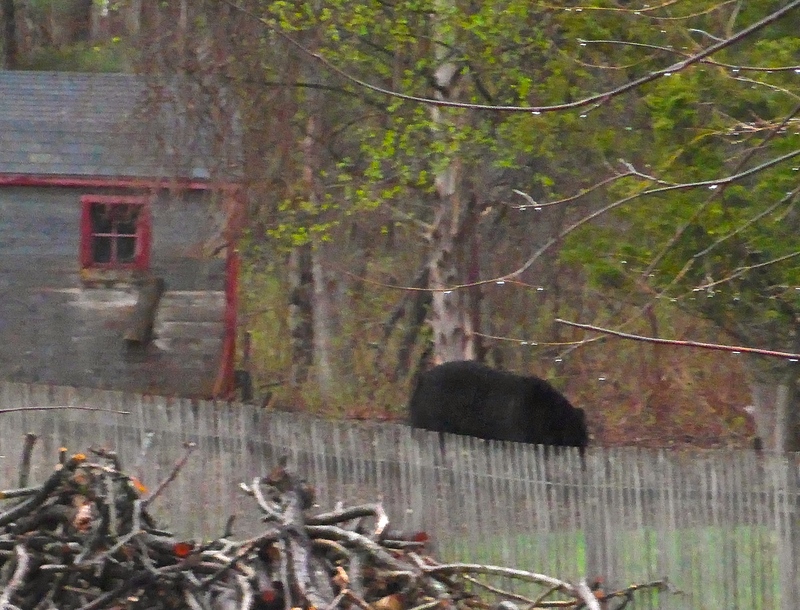 Unfortunately, he/she ambled behind the neighbor’s house before I got a good shot but here’s some proof anyway. Very healthy looking and very large animal. I wonder if that’s what Esther the wonder lab has been upset about at night. Well today is pretty darn ugly – 45 degrees and raining.. on April 26th. The grass sure is getting green though. The bloodroots were in fine form the last few days but now the wind and rain are doing them in. Here they are in all their glory – some singles and doubles. 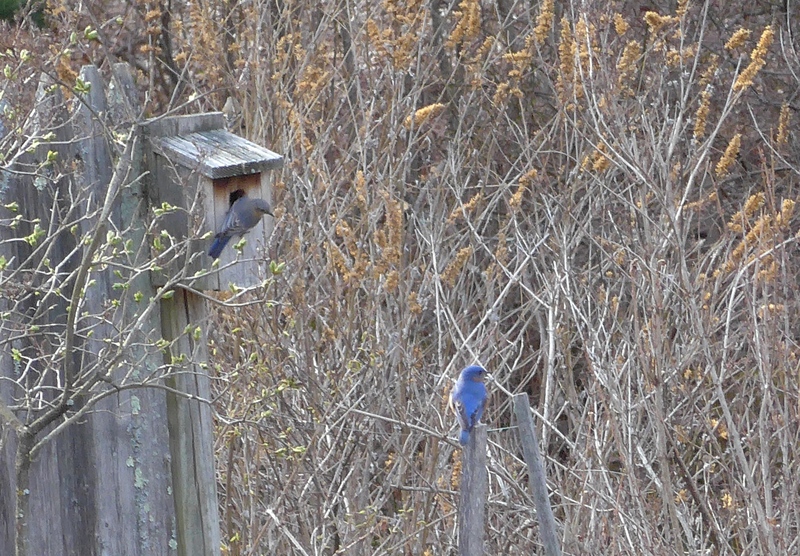 The bluebirds are doing more house hunting, and I hope they like what they see and will move in. 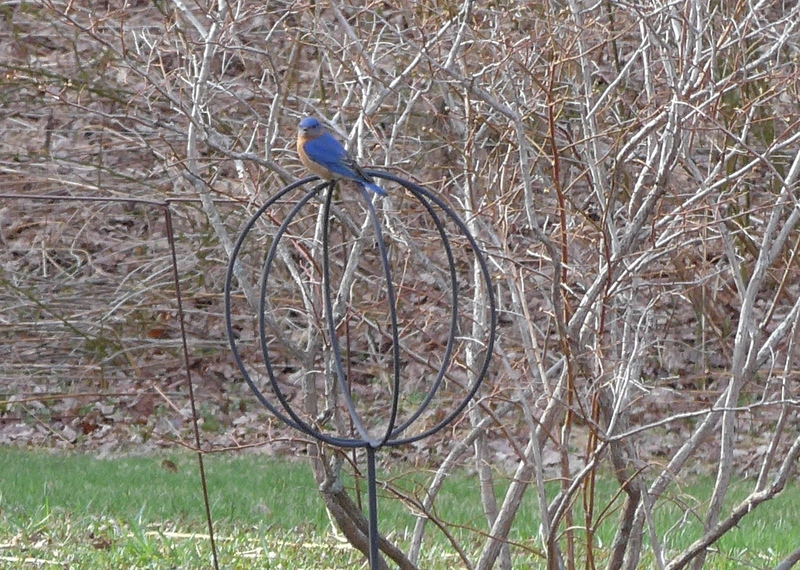 In the meantime, its wonderful to see those brilliant flashes of blue around the garden. 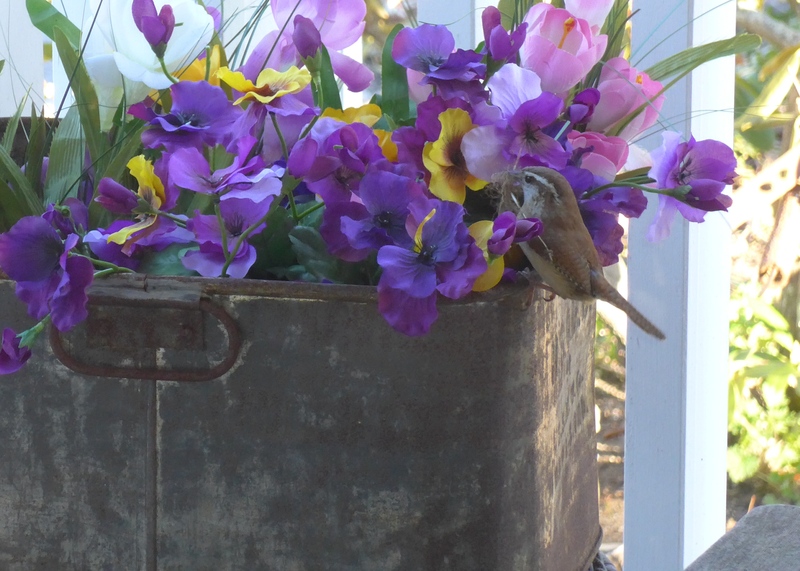 Some Carolina wrens have decided that they would like to raise a family in the bin with the fake pansies that I put on the porch a few weeks ago before the real pansies were available. It should be fun to peek in on them from time to time. 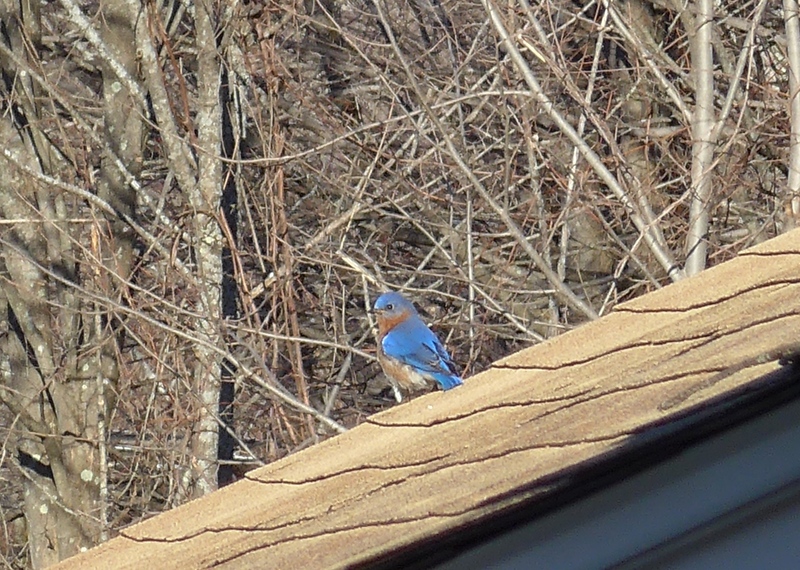 I took these photos through the kitchen window so they are a bit fuzzy. There is something about the ephemerals. Is it because they are some of the first blooms of spring or because many of the blossoms are petite? Is it because many of them don’t hang around for long that makes them so special or because they have funny names? For some, the bloom is fleeting but the leaves will linger, for others the whole plant just dies off and waits until next spring for a reappearance. Whatever the reason, they are some of my favorites. 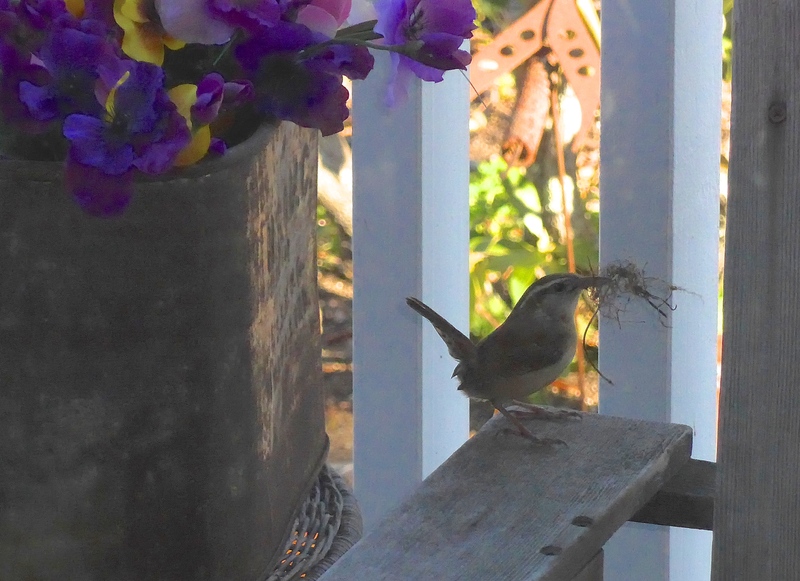 This lovely lady is not ephemeral, but I wish she would be. Esther, the guard labrador, was growling fiercely one afternoon. I admonished her for getting excited about what was probably a squirrel. 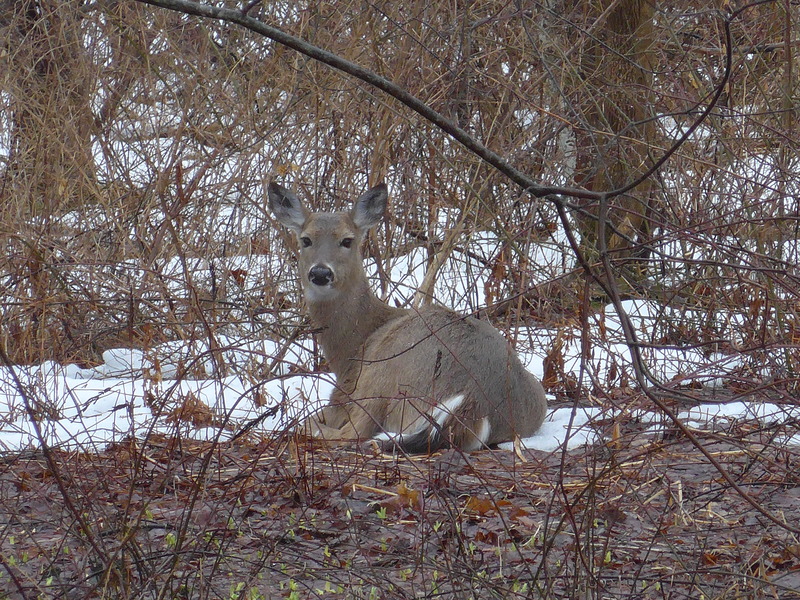 When I went to see what the ruckus was about, there was this doe munching at the edge of the garden. 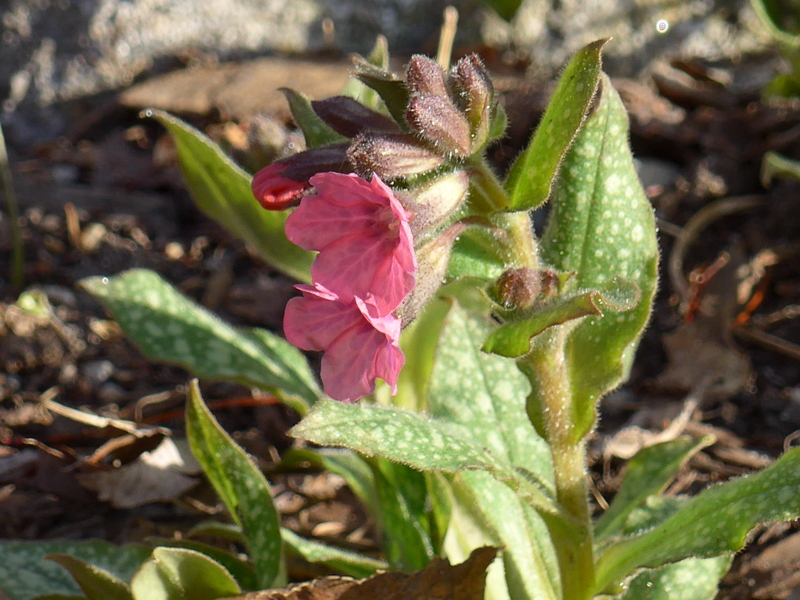 Grrrrrrr …..
Lungwort – Pulmonaria. These are just beginning Here are the pink ones, the blue ones haven’t popped yet. 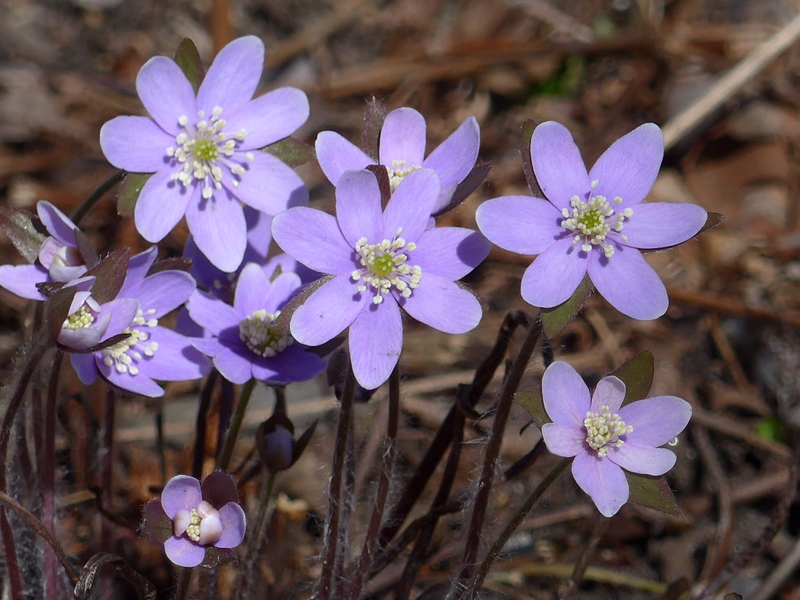 Liverwort – Hepatica. 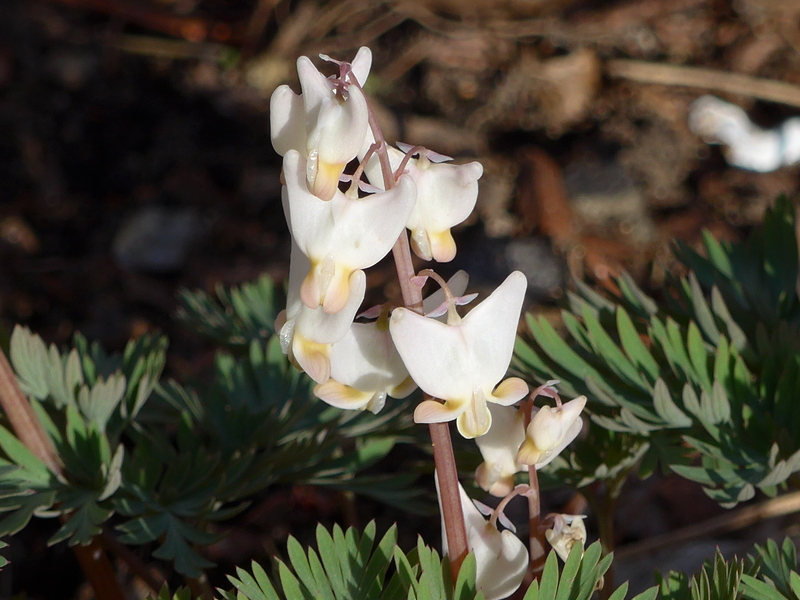 The blossoms rise up on little hairy stems before the leaves come out. 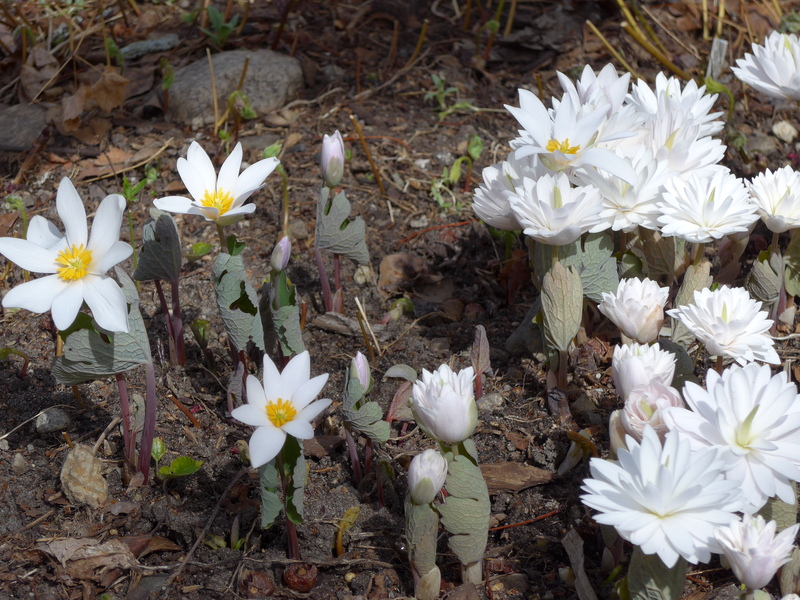 Bloodroot – Sanguinaria. There are doubles and singles in this grouping.. not fully out yet, but I like this stage as well. April showers are here (and I’m hoping they will remain rain showers and not become snow showers). We were away for a week and the warm weather certainly made a difference in the garden. When we left last Tuesday things were just poking through the ground. Now there are daffodils with buds on them just ready to open up. 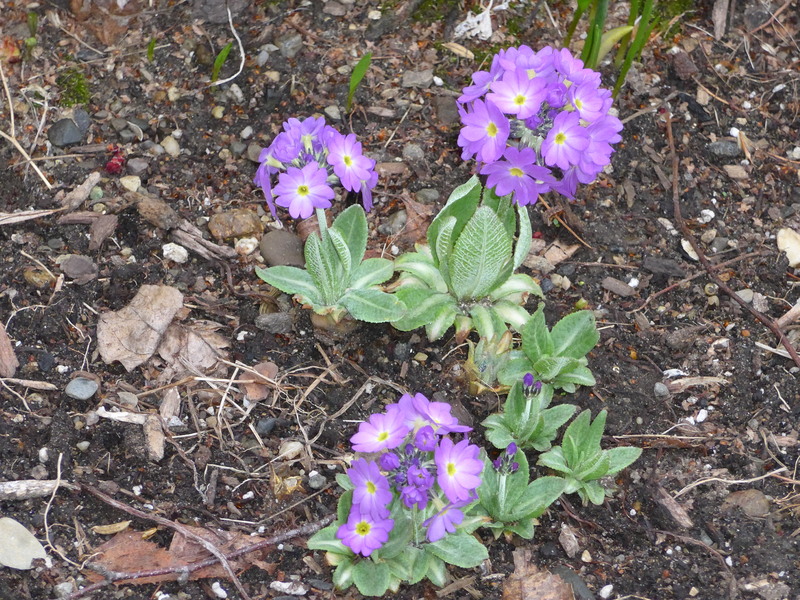 Blue scilla, crocuses, hellebores, and a few primroses are blooming, and there’s all kinds of stuff budding. 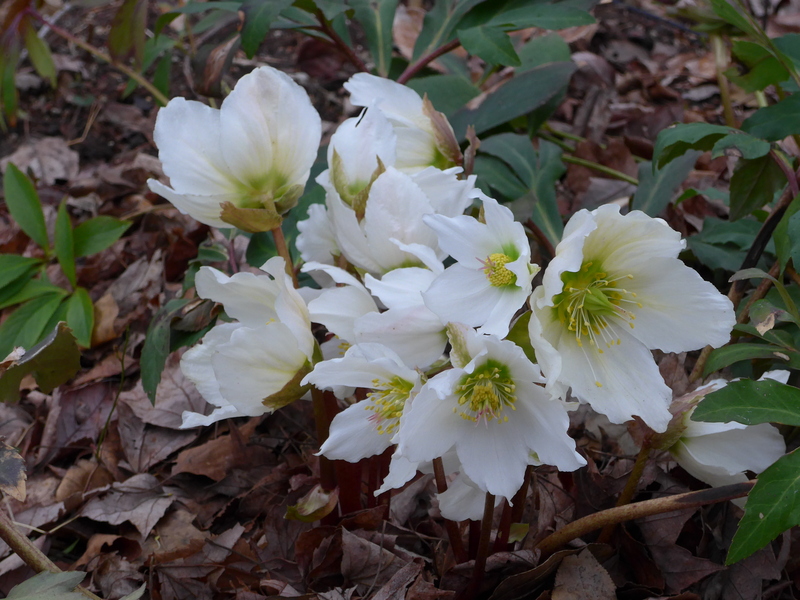 The next few days will be cold and that will slow the blooming but there should be a good show pretty soon. 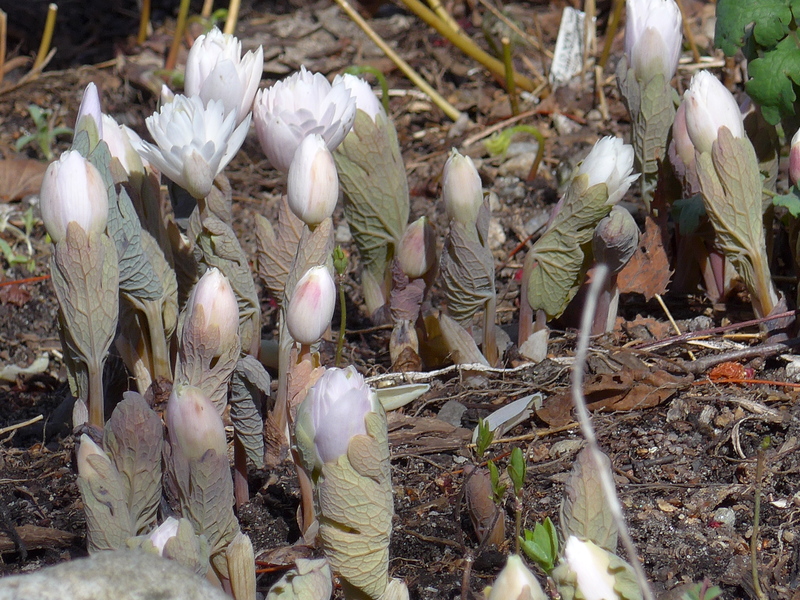 The alpines in the troughs are beginning to come back to life too…. 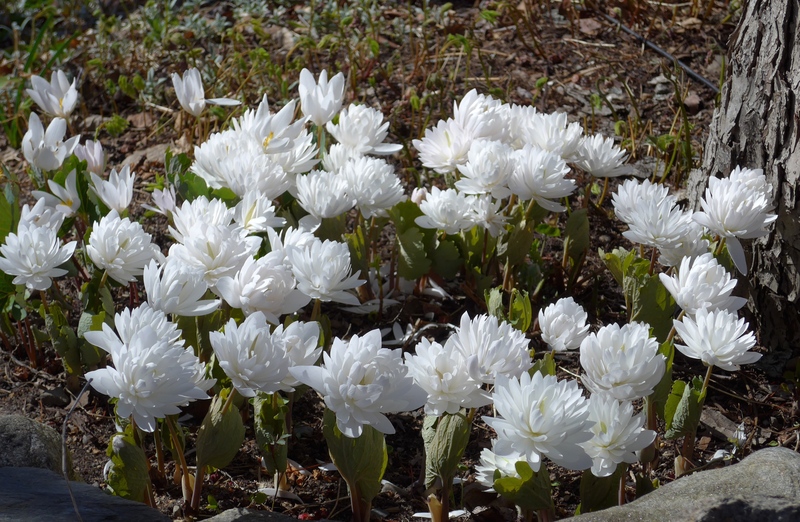 more on alpine troughs next week. 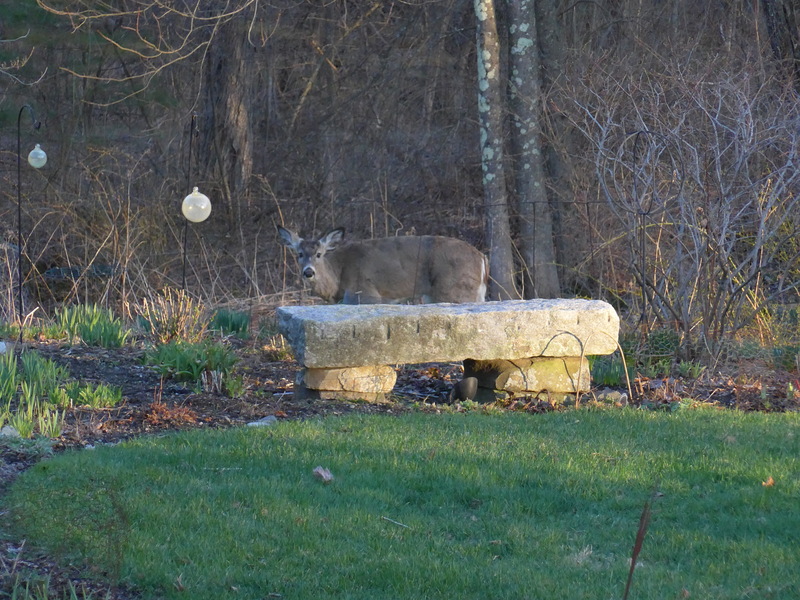 Unfortunately, the deer visited the garden while we were gone. 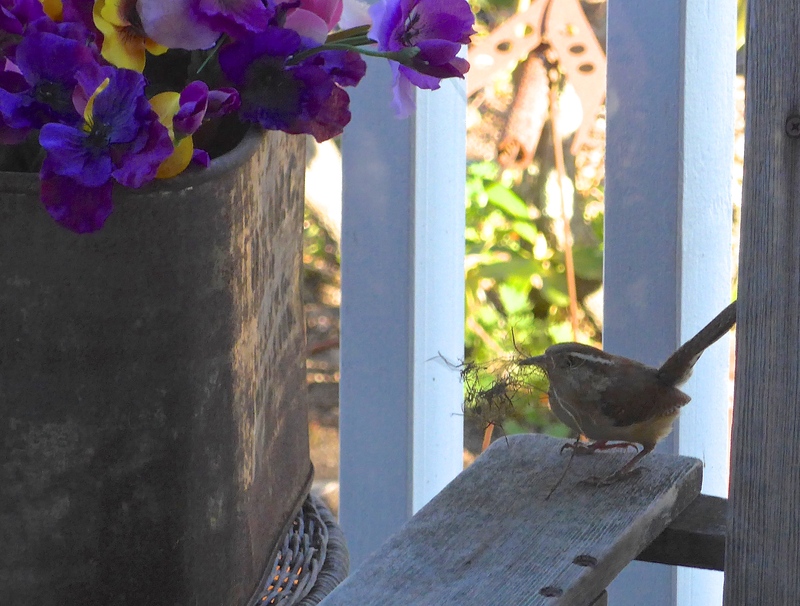 They ate a few daylily shoots and some tulips. I’ve sprayed deer-repellent and Esther the wonder dog is back to barking at shadows in the night so I am hoping the deer will stay away. Varmints!! 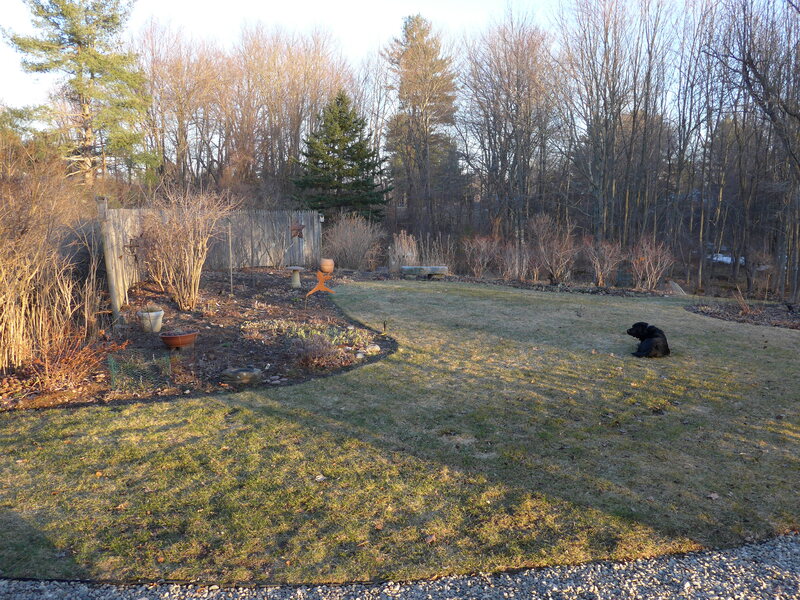 I think we’ve turned the corner.. the snow has melted in most of the yard, although there is still some left in the woods. The garden is waking up, every day something new pokes through the ground. We’ve also had some other visitors. There has been lots of interest in the birdhouses and some have nests already. Ah… time to turn this blank canvas into something special. Yeehah! 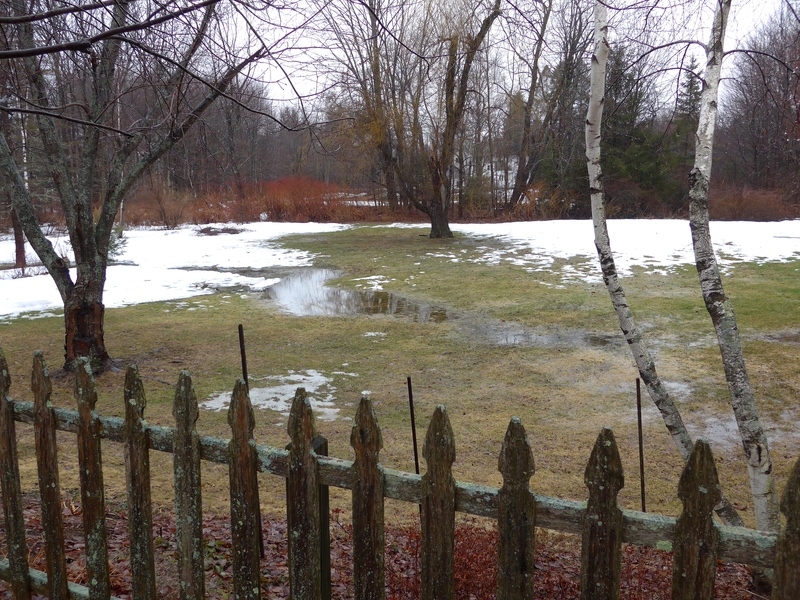 The rains have ended for now and the annual lake has developed in the field. Its a low area which always collects water after the spring rains come and the snow melts. One year we even had ducks swimming out there. The dog loves it. 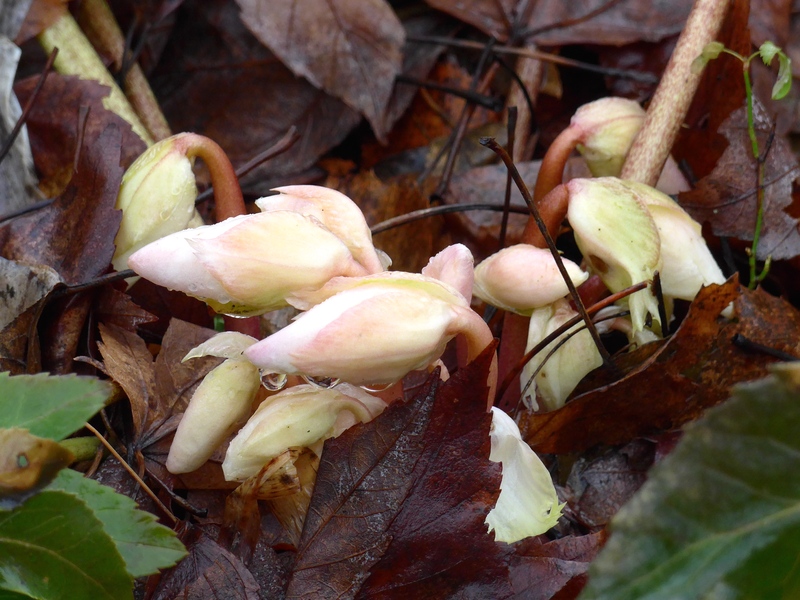 The rains also melted off a huge pile of snow out in the garden and look what was underneath – hellebores! Yippee… now for a little more warmth and some sunshine please. Winter just doesn’t want to let go. There is a giant storm off shore and the winds are howling even inland. The woodstove is roaring away and keeping me warm but it doesn’t feel like a spring day one bit. I can see the main garden from my window where i’m typing and some is still under a snowy blanket while some is peeking out from under the covers. I went out briefly this morning and saw that a few daffodils have poked through the ground. 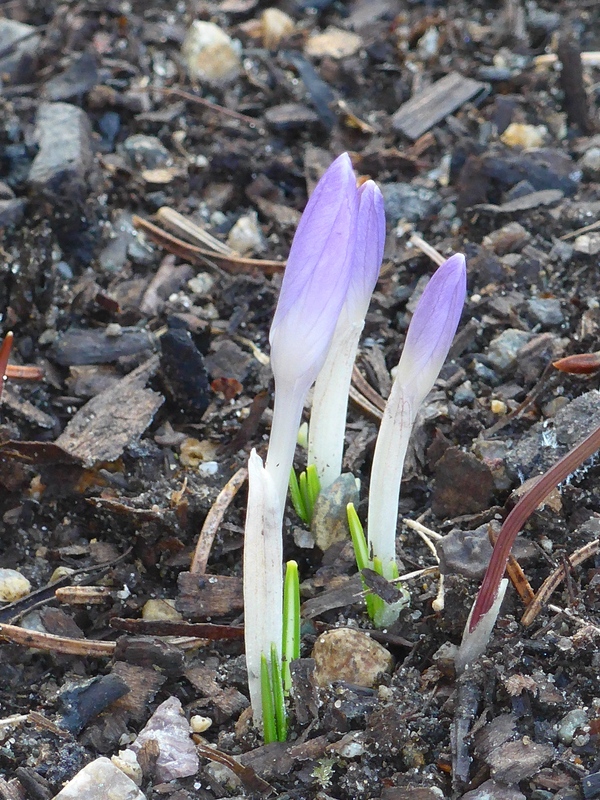 Some crocuses and tulips have just barely broken through the dirt. No buds yet. This weekend the temps are supposed to be in the 50’s so I’ll venture out for an assessment of winter damage and a closer inspection to see if anything exciting is happening out there. We have some old willows on the property. They always take a beating and the ice storms a few years ago really took a toll. One in particular has a lot of rot and will probably have to come down before it falls down. The trunk has developed quite the personality though.. he looks like something out of Tolkien don’t you think? 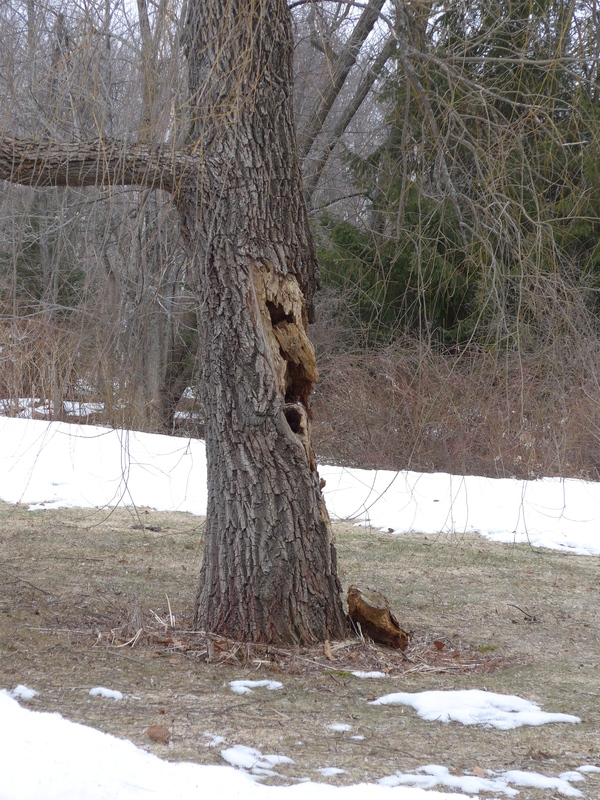 I hope we can save the tree, but Old Man Willow may have seen his last winter.